Take home some Cypriot handicrafts and moments of your time on the island. With a history that goes back to prehistoric times there has always been a strong Arts and Crafts movement on the island, and no where more than around the Coral Bay area which is home to some of the oldest settlements on the islands. While hand made crafts are no longer part of daily table ware or clothing in the modern society that is Cyprus there is still plenty of innovative materials being made as souvenirs for the many visitors to our sunny island. Today pottery, embroidery and basket making are some of the most enthusiastically maintained traditions, taking inspiration in their motifs not just from antiquity but from the environment of sun, sea, wildlife and sand which shapes every day on the island. 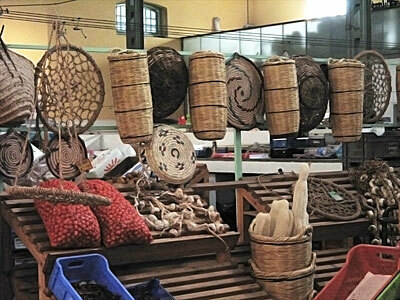 Cyprus Handicraft Centre - Located in Paphos at 64, Apostolou Pavlou Street, it is located on the main road through Paphos. As well as workshops there is of course a place where you can buy for yourself products made from precious stones, metal, wood or textiles, silk, wool or cotton using traditional techniques. Paphos Town Market - For a more varied and economical range of shopping check out the town market. Located between the Mosque and the old Turkish Baths this mixed covered and open market holds all types of handicrafts and simple souvenirs for sale. Timi Open Air Market - Only open on Sundays in the morning until lunch time this is a locally managed market which provides all kinds of handicrafts at very reasonable prices.